Ina Garten, better known, perhaps, as the Barefoot Contessa, has a wonderful new cookbook out this month that I wanted to let everyone know about. It's called Barefoot Contessa Back to Basics and it delivers what it promises: simple, timeless recipes that don't skimp on flavour. There are also plenty of entertaining tips and menus for the novice and the more practiced host/hostess. "I have to admit that food trends don't really interest me," she told Style at Home magazine. "What I need is pretty simple. I want an easy recipe that I can make in advance if possible, and when guests arrive I want the house to smell wonderful. When I talk about getting back to basics, I'm not talking about plain mashed potatoes. What truly fires my imagination is taking ordinary ingredients and cooking or pairing them in unusual ways that unlocks their true flavours." 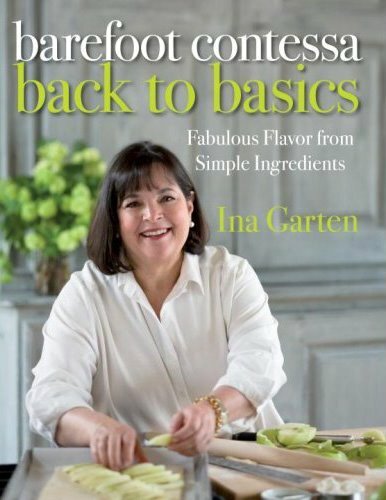 Back to Basics is the sixth book by Ina, who now also has a show on the Food Network and a line of pre-packaged food items called Barefoot Contessa Pantry that includes coffees, dessert sauces, marinades and cake mixes. Visit her website for more information. In 1978, Ina, who was then a White House finance analyst, wanted to flee the canned pressure of D.C. and do something she loved full-time. She took a chance on buying a small catering shop in the Hamptons and took it from there, with no experience as a professional shop owner. Called Barefoot Contessa, the place became the hot spot for the area's elite: Steven Spielberg and Lauren Bacall were regulars. Ina's specialty was making ordinary foods in extraordinary ways. Something as simple as onion dip was done up Ina-style with carmelized, pan-fried onions. Everyday dishes like meatloaf and chicken soup were given new punch by using the freshest local ingredients. In 1996 Ina sold Barefoot Contessa to two of her employees who continued those traditions. When Martha Stewart purchased Lily Pond Lane in the Hamptons in 1992 she was quickly impressed by Ina's talents. Ina appeared on the Martha Stewart Living television program and was continuously urged by Martha to write a cookbook, which she eventually did: The Barefoot Contessa Cookbook was released in 1999. Following this, Ina was hired by Martha to write a regular column for Martha Stewart Living magazine called Entertaining is Fun, which appeared between October, 2000, and August, 2001. Today, Ina has six cookbooks under her belt, including Barefoot Contessa Family Style and Barefoot Contessa in Paris. "I've actually been looking around for years for a way to do the basics. But at the end of the day, a lot of my recipes are basic," she says. "The idea has been rattling around in my head. I realized what's important to me is flavor. There's a brightness and a depth of flavor that I'm looking for." 1. Appetizers that take two hands: You're holding a cocktail, having a good conversation, and someone offers you a grilled scallop served in a martini glass. What are you supposed to do with your drink? 2. Beets or red wine: If you're serving buffet style and eating dinner on your lap in the living room, you're just inviting disaster. Save these for the dinner table. 3. Three rich courses: It's important to balance the weight of the courses. If you're serving a rich main course, start with a small salad and end with baked fruit and a homemade cookie. Your friends will thank you. 4. Garlic and raw onions: I like chicken with 40 cloves of garlic as much as the next person, but I don't love the breath that comes with it. 5. Spinach and poppy seeds: How many times have you been conversing with someone you barely know and find yourself staring at that stray piece of spinach or that little poppy seed stuck in their teeth? 6. Corn on the cob: Same problem as spinach. If I serve corn, I cut it off the cob, saute it with some butter, salt and pepper and serve it in a big bowl. No dental floss required. 7. Two fish courses: Most people eat meat, but fewer eat fish and seafood. If I'm serving smoked salmon to start, I'm always sure to have a traditional chicken or filet of beef for the main course. 8. Offal: If your family loves liver and chitlins, great - make it for them. But don't spring it on unsuspecting dinner guests without checking first. 9. Nuts: A lot of people don't like nuts or are allergic to them. Unless I know my guests really well, I avoid dishes with nuts or at least provide an option. 10. Raw beef, fish or eggs: I never eat steak tartar, sushi or raw eggs unless I know they're from a safe source, so I'm not about to serve food to friends that requires me to explain its safety. I didn't know Ina had another cookbook coming out?! I have a few of hers, one personally autographed to me, which I love! She is similar to Martha in many ways, but perhaps seems more accessible, less intimidating, and has -though I hate the expression - a warmer personality. Like Martha, she lives in a beautifully restored, classic home surrounded by lovely gardens, and her easy yet elegant lifestyle is the envy of many. One correction to your short Ina bio - the speciality store she purchased in the Hamptons was already called the Barefoot Contessa when she bought it, and she kept the name. Yeah, I love Ina. She's more "motherly" than Martha, I would say, and less task-oriented and ambitious, which is fine. I like both of them, even though they're very different. And thanks for the correction! Thanks for sharing Ina's tips on entertaining. I would like to add cilantro to her item with spinach. I try to avoid serving anything with cilantro because it gets stuck in between the teeth.